Motor Numbers, More Than Just Size? I get that the first four numbers for a motor represent its diameter and height, but can they indicate more than just the outer dimensions? Why, as an end user, do we care about size—unless the motor is so huge (unlikely) that it is unusable. Do these numbers somehow represent weight? I was mistakenly sent a 3512 from a supplier instead of 2810, and it’s pretty damn heavy. I believe the main issues are that over recommended sizes creates balance problems, torque problems, and efficiency problems. The 3512 will fly it but you'll have to put so much weight to balance it that it can become unflyable. If you dump the throttle on it it can just flop your plane over especially on take off. Then efficiency is ruined. It may fly but you'll need much larger capacity batteries, larger speed control, and props to make that motor efficient. All of that combined destroys the weight and gives you a plane that is HARD to fly. Ideally you want the lightest weight with just enough power yo make it do what you want. Too much weight and power will also be extremely hard in the airframe. I built a swamp buggy once and put on a much larger motor. It was so hard on the framing I had to rebuild it after every other launch. That's a much more serious issue if you are in the air and experience airframe failure. I have never found that those numbers correspond to actual weight. I have seen that certain sizes are called as a so many gram motor but the actual numbers are what you need to start with. Different properties result from different sizing, for example a wider, flatter motor makes more torque at lower to mid throttle, with the other properties the same and a taller motor with a narrower profile will make more top end. In planes weight is really important, a heavy motor will alter the CG quite a lot, which is sometimes useful but generally lighter and as close to the original spec of the design sheet is best. One important spec not really mentioned is the windings, more so related to power not as much to weight . The more windings as a rule the more powerful motor (what type of magnets are a big part of it to) . 2 identical sized motors and some will have say 5T on it and the other 6T , the 6T has more windings and should be stronger. One thing to be aware of which confused me when starting out is that Hobbyking doesn't follow the general motor label numbers (esp with the Turnigy motors they sell) but indicates the external dimensions rather than the stator size. Eg the Turnigy 2826 is actually more like a 2212 motor from other brands. Looking at the weight helps in determining similar range motors. Yes, comparing motor from different places is difficult. 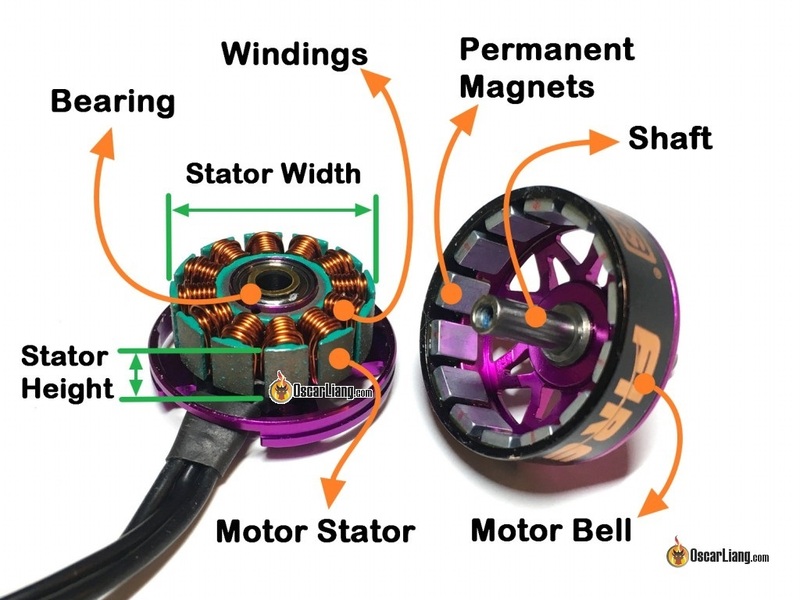 Hobbyking doesn’t help by not adapting the standard of measuring the stator, instead they measure the outside of the bell. There is a correlation between size and weight and power (measured in watts). When considering a motor always look at the weight, watts, and thrust produced.